Those occasional commutes are looking to be even rarer as the light fades into the fall unless you happen to have a trusty CatEye Volt 400 XC Headlight waiting in the wings. With a price that won't leave you cringing, this light attaches quickly to your handlebars with a handy rubberized hook mount to deliver 400 lumens of bright visibility. Four modes let you balance brightness and battery life, and a double click quickly switches the light to high mode no matter what mode you were in for easy access to extra light when you need it. 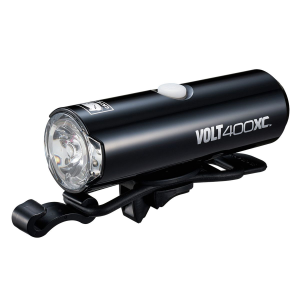 The CatEye Volt 400 XC Headlight makes use of a high-intensity white LED to deliver a clear, bright beam and boasts battery run times ranging from one hour on the high, 400 lumen setting up to 20 hours on the flashing, 100 lumen setting.